Please meet Silly. Silly has been hanging out around one of our client’s homes but would really like a forever home of his own. Silly is a little rough around the edges to look at but with love, care and good food his scruffiness should turn into a soft plush coat in no time. 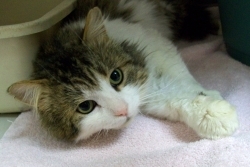 Unfortunately this little guy is looking for an extra special home as he has tested positive for FIV. 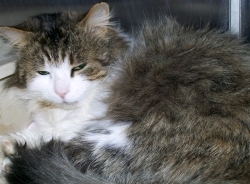 He’s going to need to be either in a home where he’s the only kitty or with other FIV positive cats. For more information please check out our medical support section. He’s a little scared of new things but is a real sweetheart once he settles in. Silly has been up for adoption at our sister clinic for the past couple of months....well he's decided that since Mojito was leaving a job opening he was just going to have to fill it. So he's trying out as the new clinic greeter. (shhhh.... we say he's trying but he's already got the job just don't tell him yet!) Make sure you say hi the next time you stop in. If you’re interested in Silly please email the clinic at reception@thecatclinic.ca or you can call us at 905-387-4151 for an application.